Netflix ranked the top Internet service providers by speed for November. Netflix on Tuesday released a list of the nation's fastest Internet service providers based on their Netflix streaming speed, placing Google's new fiber network at the top of the heap. 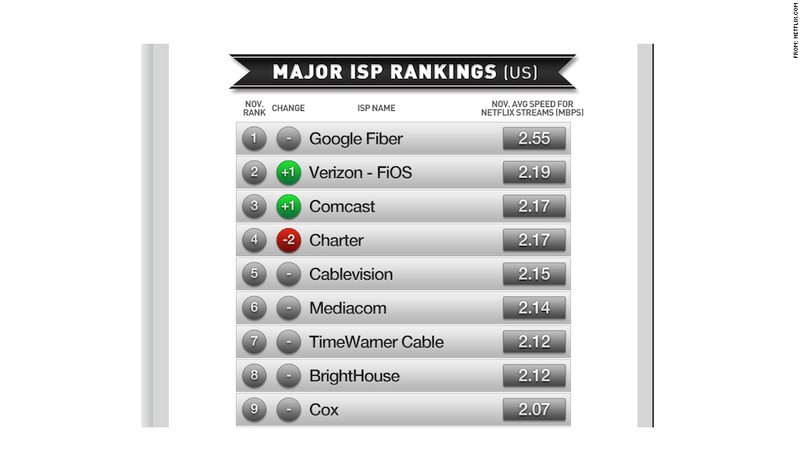 In the first of a new series of monthly rankings, Netflix (NFLX) said Google (GOOG) Fiber -- which currently only exists in Kansas City, Kan. -- averaged download speeds of 2.55 Megabits per second while customers watched streaming Netflix video last month. That was far and away the fastest speed Netflix recorded -- 16% faster than Verizon (VZ) FiOS' 2.19 Mbps speeds and 18% faster than Comcast's (CMCSA) 2.17 Mbps average. Charter (CHTR) and Cablevision (CVC) rounded out the top five, with speeds of 2.17 Mbps and 2.15 Mbps respectively. Keep in mind, these speeds are only relevant to Netflix's streams, which top out at 4 Mbps. 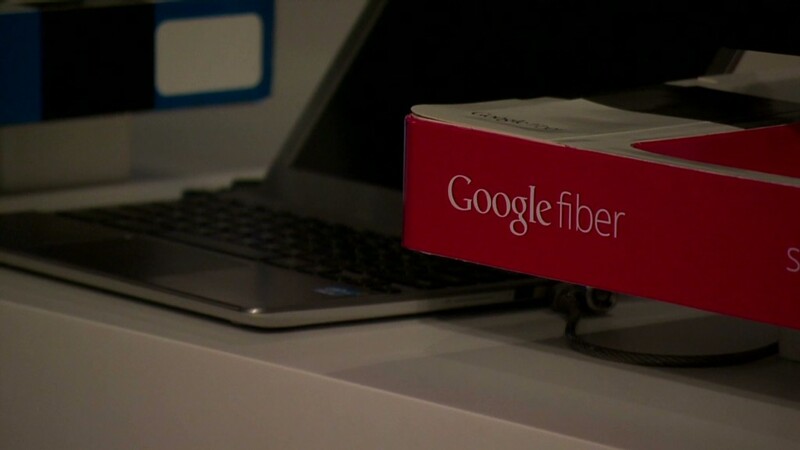 Google's fiber service advertises a maximum download speed of 1,000 Mbps, and Verizon FiOS has top speeds of 300 Mbps. But Netflix is a good real-world gauge of a network's speed and quality. The site's 30 million global members stream more than 1 billion hours of video each month. Unlike web browsing, which starts and stops with each click, streaming video requires a constant flow of data over the network. A sudden change in speed or response time can stall videos and reduce the picture quality. The heavy demands that the streaming video places on networks has contributed to Comcast, Time Warner Cable (TWC) and others' moves toward monthly data caps. Speed isn't the only factor in determining streaming video quality, but it's an important one. For the most part, fiber-based broadband services were the fastest in Netflix's test, followed by traditional broadband, DSL service and 4G wireless service. 3G wireless brought up the rear. It's not surprising that Google tops the list: The company is bringing high-speed fiberoptic cables directly into people's homes to deliver blazing fast Internet, television and telephone service. Fiber is a great service for those who are lucky enough to have it, but if you're not one of them, don't hold your breath. Bringing fiber to the home is an incredibly expensive proposition. A Goldman Sachs (GS) research note on Tuesday estimated that it would cost Google $140 billion to build its fiber network across the country. Verizon, which attempted a similar endeavor with its FiOS network, has said that it won't expand the offering to any new markets. For the most part, cable providers run copper lines to their customers' homes, which offer significantly slower speeds. To bring higher speeds to customers without breaking the bank or ripping up people's yards, many companies are compromising by bringing fiber connections as close to the home as possible -- usually to an Internet core router or "node" that serves an entire neighborhood. AT&T (T), for instance, announced last month that it would expand its previous plans to bring fiber to the neighborhood level for its U-Verse service -- which ranked 11th in Netflix's list. The plan will cost a total of $14 billion -- a tenth of what it would cost to bring fiber to every home, according to Goldman Sachs. As for the wireless carriers, the all-4G Clearwire (CLWR) service topped Netflix's list with an average speed of 1.18 Mbps. Verizon ranked highest among the carriers that offer both 4G and 3G service, with an average of 0.76 Mbps, followed by T-Mobile's 0.64 Mbps, Sprint's (S) 0.56 Mbps, and AT&T's 0.48 at the bottom.